The rental fee of Mas Santo includes 10 bedrooms for max. 20 guests. The villa hosts up to 32 guests. For the extra guests an additional fee is applicable. The main building has 7 spacious bedrooms and 4 shared bathrooms. The guesthouse has 2 bedrooms and 1 shared bathroom. The spacious suite has a private bathroom and terrace overlooking the pool and garden. The maisonnette is only rented to host extra guests. It features two bedrooms, a bathroom and an optional sofabed. The two Glamping bell tents host 4 guests. The villa consists of 500 sqm of interior living area. ●	From the entrance of the property, you access the villa via the stairs, crossing a 35 sqm terrace overlooking the pool and garden. Entering the villa on the first floor you will find the open kitchen, dining area and living area. ●	The dining area of 30 sqm on the first floor is located next to the open kitchen and has a big table. The villa has 2 interior kitchens and 1 exterior kitchen. ●	The 12 sqm kitchen on the first floor is fully equipped kitchen with fridge, freezer, Nespresso and filter coffee machine, toaster, microwave, blender, hand blender, dishwasher, stove with 8 gas burners, 2 ovens and 1 pizza oven, and all necessary utilities. ●	The 6 sqm open kitchen of the annex is a typical Catalan style kitchen, fully equipped with fridge, freezer, Nespresso coffee machine, microwave, stove with 4 gas burners, dishwasher and all necessary utilities for basic meals for the guests staying in the annex. ●	The outdoor kitchen located at the pool area features a sink, fridge, small freezer, gas BBQ, dishwasher and utilities for outdoor meals. The villa has several dining areas, both indoor and outdoor. ●	The pool is surrounded by a tiled terrace ideal for sunbathing, featuring a big table with chairs and sail for sun protection for fantastic outdoor meals. We can provide a range of additional services to make your holiday that little bit more special. Mas Santo is a unique event location to celebrate family holidays, memorable weddings, business trainings, inspiring meetings, product presentations or photoshoots. The venue allows events with groups up to 80+ guests. Our guests were completely in love with the place and had enough room to tuck away for some alone time. May 28, 2018 Chantale W. "We stayed at Mas Santo for 4 nights for our wedding in May of 2018. We had 22* people sleeping in the house, The house could accommodate that number comfortably. The stay itself was all we could have wished for. Our guests were completely in love with the place and had enough room to tuck away for some alone time. We had a wonderful dinner by the pool with over 40 people the night before the wedding. Unfortunately it rained on the day of our wedding but the good news is there was more than enough room to put up a tent to hold everyone. This place is quite special, off the beaten path, you'll experience tranquility and nature. Carmen is a fantastic hosts and the grounds keeper was there for any request we had. If only we could get married again!!! hahaha, Thank you for making our special day even more special." Each guest, incl. extra guests, will have 1 duvet and 2 pillows. Babies sleeping in cots will get linens too. The villas has 3 kitchens, 2 indoor and 1 outdoor. The kitchens are fully equipped and great for 32 meals. We had a wonderful stay Mas Santo. We were 18 people and the house was perfect with plenty of space. Very nice decorates in every corner of the place. This is a very beautiful house and location. Serenity is what I felt as soon as I arrived at Mas Santo. There are so many different angles, rooms and spots at the terrain that it is easy to relax. I enjoyed some time by myself, it is completely quiet. The nature is amazing. Even at the hillside herbs and flowers are growing everywhere! Carmen and Fares were wonderful hosts and the food was delicious with pure ingredients. I am looking forward to coming here again! When we arrived the place was more beautifull than the pictures could show. The place is nice, luxe, clean, large and still cosy. I would recommend this place to anyone who likes the combination of luxury and space. We were 10 adults and 10 children that spent a week at Mas Santo. The place is very nice. The poolarea is excellent for children. Cosy livingroom and kitchen with a lot of space. It was very hot (around 38 degrees) when we were there, so we missed a fan in all the bedrooms. The pool was clean, but the playground seemed not to be used lately. We missed a lawn/green place were the children could play football etc. The cleaning inside the house was not good at our arrival. The place needed a scrubdown. I contacted the owner, Carmen, to tell her this and she did all she could right away to fix it. The sittingarea outside the kitchen seemed to not be used in a long time and was guite dirty. The cleaners should wash tables, chairs, terrace before new people arrive. The cutlery in the kitchen could have been upgraded, f.ex with things from IKEA. We missed knives and more saucepans. The place may suffer a bit of the owner not living in Spain. But all over - we had a wonderful vacation and Carmen was a very nice host. Easy to get in touch with and she responded when I told her that we were unsatisfied with the cleaning. Thank you for your review and yes the cleaning was not done as we are not used too. The cleaning team learned from this mistake and need to take more attention to the cleaning. Sorry for your wrong start. We thank you for your advice to change and add cutlery we will change this immediately. With this we can solve it and continue to offer our guests a fantastic stay with calm and privacy. 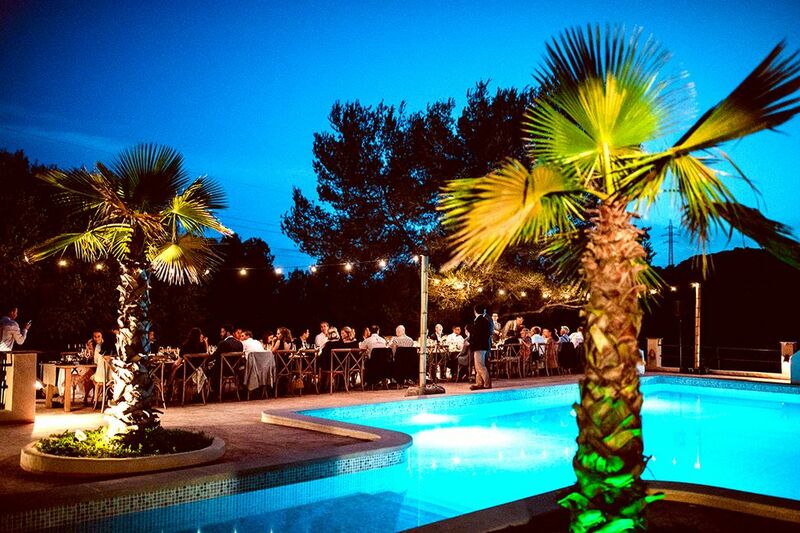 We had an amazing time at Mas Santo which is in a brilliant setting in the hills above Cunit. Although not in the best location for getting to beaches, it was a perfect villa for a big group of us (23 people) - with all the facilities we needed and with beds to spare. The villa has a huge kitchen with everything you need, and a great pool area with plenty of chairs and table space for enjoying long lazy meals. Carmen (the owner) has been very helpful and prompt at returning our deposit. Meno (the caretaker) is also great and thoroughly willing to assist if needs be. I would highly recommend Mas Santo for any large group. The closest beach of Cunit and Cubelles are located on a 5 min. drive. Its beaches are wide and not crowded, even in high season. The zone has a great variety for watersports, boat rental, golf, tennis and the local sport paddle. Lively and international beach village Sitges is located on a 20 min. drive, featuring an authentic old town with a wide variety of bars, restaurants, local shops, boulevard and harbor. It’s famous for its 17 excellent beaches, tourist facilities and festivals all year round. Vilanova i La Geltru, on a 10 min. drive, is a complementary option as it a typical Catalan city featuring a proper Rambla, a main street great for shopping with brands as Mango, Zara, Bershka. Here you can find a big local market each Saturday. Barcelona is located on a 35 min. drive from the villa. From Cunit or Cubelles you can catch a train every 15 min. that takes you to the city center of Barcelona in 50 min. The capital of Catalonia has an average temperature of 20 Celsius degrees and unique old town areas as El Born and El Gotico. It hosts many tourist attractions as Gaudi’s architecture, shopping area La Rambla and FC Barcelona’s stadium Camp Nou. A must-do is a visit to one of the many wineries from the famous wine region El Penedes and Montsant. Tours take approx. 2 hours and you can taste wines and/or cava, the Catalan champagne. From the villa it’s a 20-40 min. drive. The extraordinary mountain Montserrat and its monastery are a nice visit for nature lovers. Located on a 1 hour drive. Roman city Tarragona is worth a visit because of the amphitheater situated on the seafront and attraction park Port Aventura and water park Agualeon, great for adults and kids. In the south of the Costa Dorada, you will find the Delta de l’Ebre, the second largest delta at the Mediterranean Sea, where nature lovers can relax. Its various ecosystems, such as salt marshes, rice fields, dunes, and lagoons, are visited by birds such as flamingos.